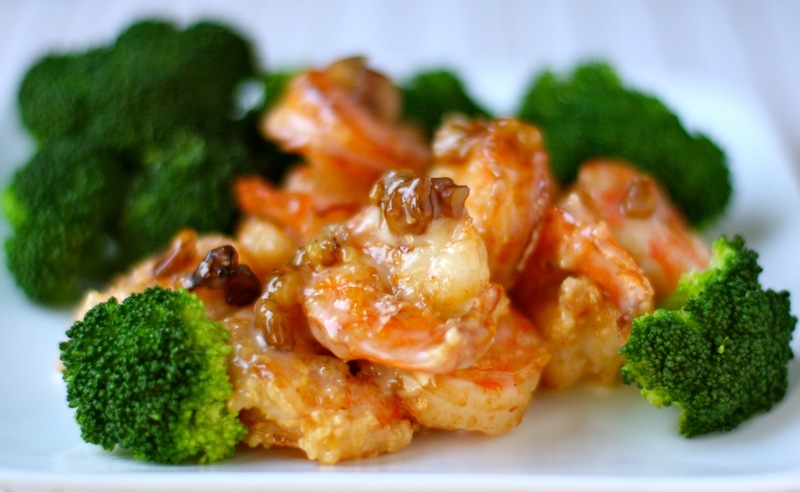 Honey Walnut Shrimp is one of my favorite dishes. I’ve always wondered how to make it, but I never bothered to figure it out since the Chinese restaurant down the street makes an absolutely fabulous version. Per chance, I was watching the program on the Food Channel a few weeks back called Diners, Drive-Ins, and Dives, and the host, Guy Fieri, visited a Chinese restaurant called Pagoda, in North Pole, Alaska (0f all places!). The chef demonstrated how he made some of the restaurant’s signature dishes, including the Honey Walnut Shrimp. (To see the show’s segment, click on the restaurant’s link below.) Seeing how good it looked, I decided to try it for myself. The only problem was that the chef was making a restaurant batch and did not specify quantities other than 1 gallon of mayonnaise, but at least I wrote down all the ingredients and the method. I just had to play around with the amounts until I came up with the ratio I liked. That’s what is great about this recipe. It can be altered, even at the last minute, to suit your taste. Since the sauce is prepared ahead of time and incorporated into the shrimp and walnuts right before serving, you can adjust it to your liking. I must have tried two or three shrimp with the sauce, adjusting it every time until I got the taste I was after. So is it the walnut or the shrimp that is “honeyed”? I prefer to add the honey to the walnuts, as the title implies, and not in the mayonnaise sauce for the shrimp. Many recipes I’ve seen since add the honey to the sauce, and not the walnuts. You decide! Combine the water, sugar, honey, and walnuts in a small pan, over medium heat, until the mixture caramelizes. Remove from heat and spread onto a sheet pan lined with parchment paper or a silicone mat. Once cooled, deep fry walnuts until golden brown, 1-2 minutes. Set aside. To make the sauce, combine the mayonnaise, condensed milk, half and half, lemon juice, and a pinch of salt. Adjust to taste by adding more condensed milk, lemon juice, and/or salt. Set aside. Boil the shrimp for 10 seconds and drain. This step should help the cornstarch adhere much better to the shrimp. Dredge in cornstarch that has been well-seasoned with salt and pepper, making sure each shrimp is adequately coated. Deep fry until shrimp turns pink, about 1-2 minutes. In a bowl, place 2-3 tablespoons of sauce and add the shrimp and walnuts and mix well and arrange in a serving dish. This is the second time I’ve seen this episode on Guy’s Grocery Games. When I saw it recently I got Benny’s name, restaurant: Pagoda, and 6 of the 7 ingredients. I’ve searched for a recipe that had all his ingredients and your did it. I’m so grateful for your hard work in figuring it all out. I have all the ingredients in my kitchen, minus the walnuts. Next trip to the market will fix that. Thank you so much. Thank you for this recipe, my friends are raving about the Pagoada’s walnut shrimp, and now I can give it a try, without leaving Juneau! Hi Charlie! No, I don’t. I just recently saw the segment again on DDD. Maybe the network will run it again and you can record it. Sorry! Today is the first time I see this episode and found your downsized version…thank you so much for sharing. I had this dish in San Francisco and have not found it here in Maine. I’m so very excited to try this!! Oh, Yum! I can see it as a Valentine’s Day dish. I think my Hubby will like it 😀 Hugs! Love your experimentation, trial and error, and ultimate success. Mayonnaise! I wouldn’t have guessed. When I leave the land of No Good Affordable Seafood (London) and come back to visit Seattle, I’ll have to try this. I LOVEEEE (!!!!!!) honey walnut shrimp. I am SO excited to make this!!!!!!!!! Thanks for sharing and writing the stuff down! This is on my food to-do list for tomorrow and I’m very excited!!! It will be interesting to see how you adapt the recipe to make it your own. I hope you like it. I battered mine in an egg white rice flour mixture, and it was really delicious. I’m going to post this soon on the blog. LOVED this dish so much, thanks for posting it! That looks lovely. It’s a very unique recipe and I;d never thought of the combination – it does sound lovely though.